If you have a grip-it-and-rip-it mentality, Broadlands Golf Course is for you. It plays 7,289 yards from the tips -- and the fairways are wide -- so your driver should get plenty of work. Don't neglect your short game, though, and you can work on your putting and chipping on the practice greens before your round. The Sunshine/Eldorado layout is one of three challenging 18-hole combinations at Omni Interlocken Resort Golf Club, a Four-Diamond award-winning retreat with a backdrop of the Rocky Mountains. The Sunshine nine features spectacular views a great finishing hole. 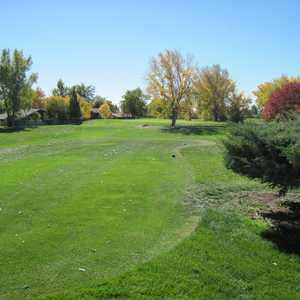 The 9-hole Greenway Park Golf Course in Broomfield, CO is a semi-private golf course that opened in 1989. Greenway Park Golf Course measures 1096 yards from the longest tees. The Vista nine, one of three nine-hole golf courses at Omni Interlocken Resort Golf Club, features spectacular views. From its 565-yard fourth hole -- the toughest hole on this nine -- you can see from the Front Range of Pike's Peak in the South to Long's Peak in the North. The Eldorado/Vista layout is one of three 18-hole combinations at the 27-hole golf club at Omni Interlocken Resort, a Four-Diamond award-winning retreat with a backdrop of the Rocky Mountains. The nine holes at the Eldorado Course play 3,426 yards from the tips.